Russell Endura 150° -6AN Swivel Fitting Standard radius: 1"
Russell's Full Flow Swivel hose ends swivel a full 360° to maximize hose installation allowing for quick alignment of ends after hose assembly. 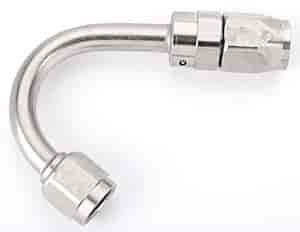 These lightweight aluminum fittings are completely reusable and do not require a sealing compound or PTFE tape for sealing. Mandrel bent one piece billet elbow eliminates brazing and enhances strength, providing unobstructed maximum flow. Available in two different styles.